About Us | Profile | KH Neochem Co., Ltd.
KH Neochem provides premium chemical products in a variety of fields focused on our three core business areas of Basic Chemicals, Performance Materials and Electronic Materials. Although it may be hard to spot them in a glance, KH Neochem products are in fact used in all forms of goods essential to the global environment and comfortable living. Through the mainstay oxo reaction technologies and manufacturing technologies for esters and glycol esters, we supply wide variety of high-quality oxo alcohols and oxygenated solvents to the worldwide market. Our unique compounds made from oxo reaction each have their respective defining functions. We utilize these functions to provide the market with raw materials of lubricating oil for HFCs, which do not destroy the ozone layer. We supply premium products to the IT industry through the fusion of our company’s strengths, i.e. high purification technology (distillation technology) and quality control technology (ultra-trace metal analysis). What is an oxo reaction? Oxo reactions, otherwise known as hydroformylation reactions, are a reaction of olefins, carbon monoxide and hydrogen to synthesize aldehydes. We are then able to synthesize a range of derivatives from aldehydes, including alcohols, synthetic fatty acids and esters. We are developing our core skill of OXO technology and unique combination of related technologies such as organic synthesis, distillation, and quality control to provide the many materials that support industry. 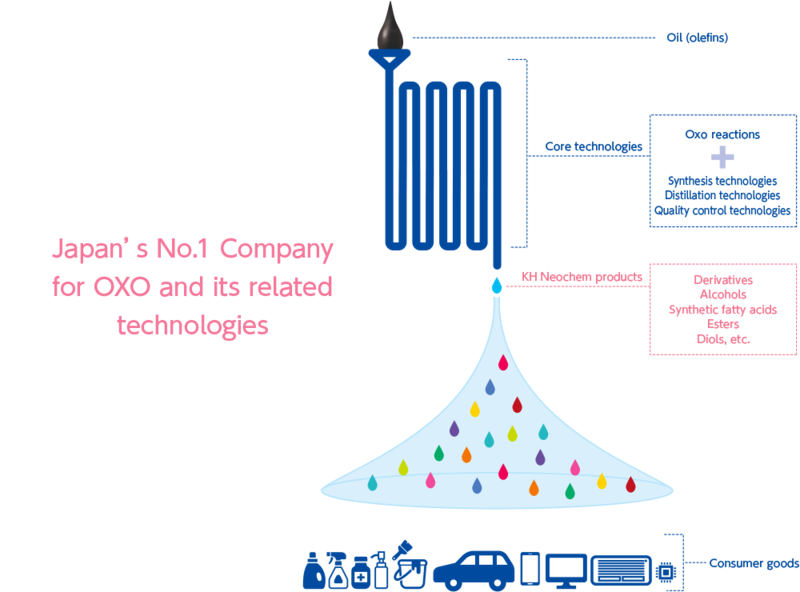 KH Neochem is the only manufacturer in Japan with the highpressure oxo equipment able to supply special alcohols and synthetic fatty acids such as isononyl alcohol, tridecyl alcohol and isononanoic acid. Copyright © KH Neochem Co., Ltd. All Rights Reserved.